A knowledge quiz is a right choice if we want to evaluate our current knowledge of a particular filed. 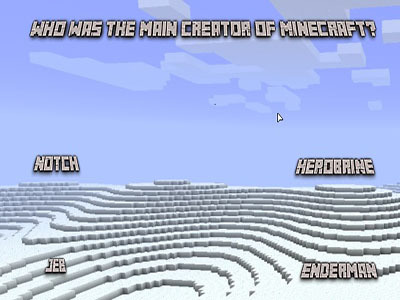 The Ultimate Minecraft Quiz is a quiz for fans to test how much information on Minecraft they have. Players are reading and choosing an accurate option among 4 provided ones for each question. A wrong one takes you back the start of the game. Many quizzes have been made to check and increase Minecraft knowledge. Please check our website to play tons of interesting games and let see how many times you are going to complete this quiz! The mouse is used to click to the accurate options.